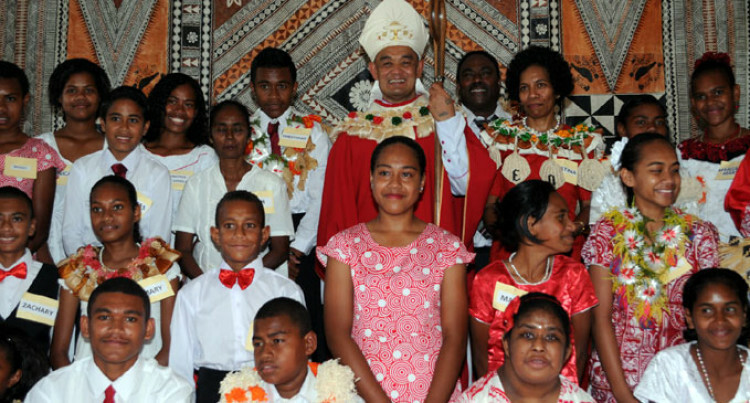 Archbishop Peter Loy Choy returned to Fiji yesterday after attending a conference at the Vatican City in Rome where he met Pope Francis and heads of the Catholic Church around the world. Father Chong yesterday passed on the messsage from the conference while attending the Confirmation Sunday Mass at the St Michael’s Parish in Nadi. “One of the cardinals who spoke to us in Rome reminded us that one of the missions of the church was ‘to transform the nation’. “This was one of the important messages that was relevant to us in Fiji given our political climate and the need for building a nation,” he said. He said there were many topics discussed at the conference but he thought this was the one that was important and relevant to Fiji. Father Chong told the congregation at the St Michael’s Parish in Nadi that the church would support the Government if they worked together for the betterment of the people. “We congratulate the Government for being elected, and the Electoral Commission for the completion of the elections. “We will support the Government and work together with them for the betterment of the people,” he said. Archibishop Chong said that Catholics also had a vision of policy-making. “From a Catholics view of policy we believe that people should learn to participate without having their rights violated and that decisions should be made from the grassroots level,” Father Chong said. He stressed that there was one thing common about the Government and faith groups. “The one thing that is common between the government and the faith groups that it is to serve the people; we need to look at things from the heart of a person and make sure that they are being heard and their concerns looked after,” Father Chong said. He also commented on relationships between the Government and the Methodist Church. “The tension will always be present between Government and faith groups; this is because they both have the mission of looking out for the people. “We hope that this Government will hear the people; we will support them but at the same note we will also speak out for the people,” he said.